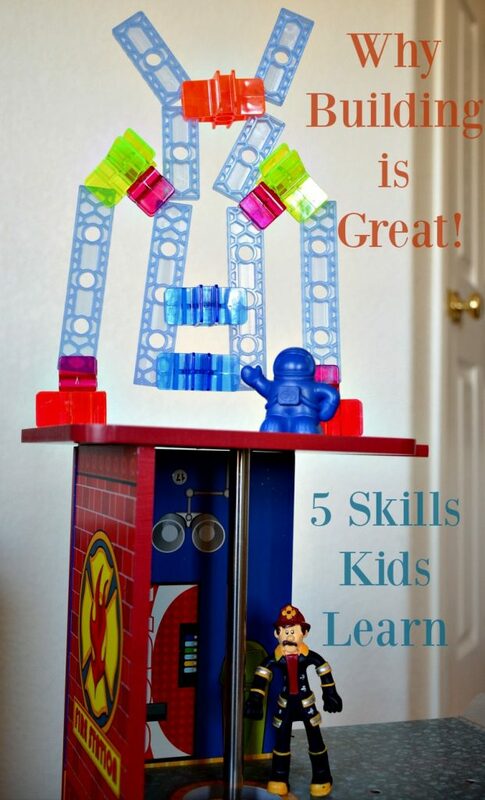 Five reasons on why educational building toys are great. Using blocks are fun, especially when we have a variety to choose from. We also know that it keeps the kids busy for awhile (yes! ), but let me give you a few reasons on why educational building toys are useful and the skills they develop as they learn. It gets those muscles moving and builds up strength in fingers and hands as they stack up or pull apart, plus increases eye-hand coordination when they fit them together. Kids develop new words as they learn to describe sizes, shapes, colors, positions, and plans. They learn math skills by grouping, adding, subtracting and even multiplying with blocks. With science they are studying gravity, balance and geometry by figuring out how it all works. Being creative is a big part of building. No two masterpieces ever have to be the same and each time they play something new is discovered. Even adults like blocks and they can get down to a toddlers level and enjoy themselves. I personally love seeing my boys work together – the 13yr old teaching the 5yr old. Right now the project on the table (literally!) 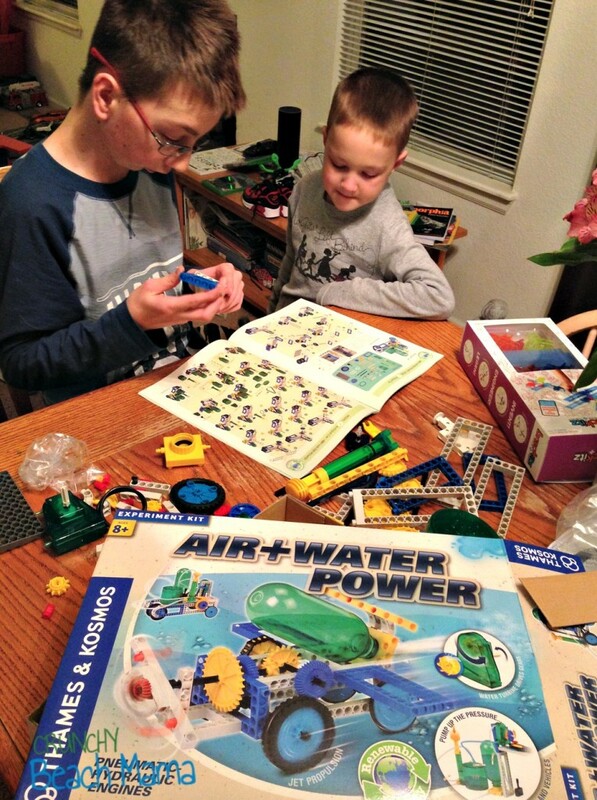 is the Air & Water Power Experiment Kit where they are learning physics by building two different air-and-water-powered systems: water-jet propelled cars and hydro-pneumo (which simply means air pressure and water pressure) powered engines. They can construct up to 15 different models including a truck, excavator, radar car, tank, antique car, helicopter, motorbike, backhoe, rocket car, forklift, roadster, propeller plane, grinder, and cutting machine. So fun, right?! Assessment Services, who makes this toy and other fun ones too, believe’s in the importance of hands on learning. They are one of the leading manufacturers and suppliers of educational manipulatives. Their learning tools are designed with educational enrichment in mind. A rocket ship for the helipad on top of the fire station? Why not! The boys used Brackitz. These are really cool and unique blocks that connect every which way. The pieces can rotate and be turned at any angle, but the fun part is they move and swivel. They have wood ones too so you can choose! Add more and more pieces to your collection as time goes on. Soon they’ll be building houses taller than themselves! 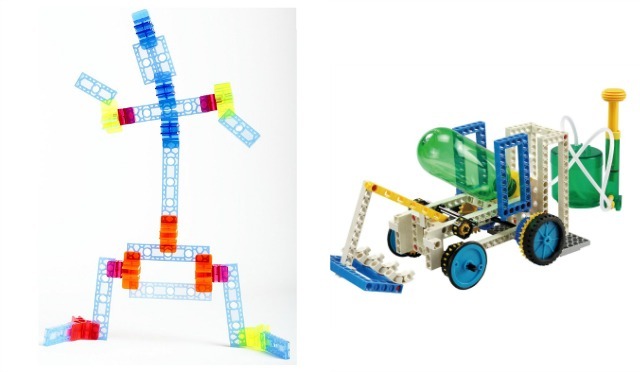 What educational building toys do your kids love to build? WIN Brackitz + Thames & Kosmos Air & Water Power! I received these items for my post to share with you. All opinions are my own. Links may be affiliate. we love to build legos, tegus, blocks and pretty much any and everything! my daughter just turned 16 months! We love to build anything and are always looking for new sets to have fun. Thank you for the chance! My grandsons love to build construction sites using their imaginations with their mega bloks and their construction trucks. My daughter loves to build houses and castles, my son loves to build cranes and tractors! We love to build houses. My 2 granddaughters love to build houses, buildings, schools, castles and shops with their LEGO sets. My grandson loves to build tractors, cars and super heroes! Building toys are his favorite! My son loves to build towers! We like to build castles. My grandson loves to build cities. My kids love to build just about anything...forts, towers, etc. They love creating stuff! Thank you for the chance!! We enjoy building houses and robots. My grandkids love to build. My grandson has a very science and creative mind. He is always trying to build inventions or making science labs with his legos. My son likes to build hideouts for his action figures. I have 3 grandkids, that would love this. Educational is a great plus. We love making things and using our imagination! My son loves his Legos. Wooden blocks are a favorite in our house. These particular blocks were made by Grandpa! Would love to win this for our nephew! We love building random stuff with wooden blocks in our home. My son loves to build animals and buildings. He also like to build vehicles. The kids like to build skyscrapers with their legos. My son loves to build anything and everything. Toys that you can build with are his favorites. We love to build because it helps us use our creativity. Dd is into making her own furniture and accessories for her dolls! She'll use anything she can find that can be cut, glued or other that she won't get in trouble for using! My kids like building things with secret sliding elevators and hidden nooks. WE love to build lego houses, sand castles, pretty much anything! How fun! We would probably build a robot first! These look so neat! We like to build from the blocks we have. My 3.5 yr old loves to build Lego Star Wars space vehicles. I'd love to get him building other stuff (expand the horizons). My kids all love to build. My son loves to build robots and my daughter loves to build houses. My son loves to build monsters and cars. My son loves to build anything. He is really creative. My kids love to build anything with LEGO. They have been eyeing Minecraft the mine for a while now. The pre-k kids love to build with blocks and legos. I would like to win this for my my nephew. They can build together at my house when they visit. My grandsons love cars and trucks but they would enjoy building almost anything, thanks! My kids love to build LEGOs and magformers! My boys like to build buildings. Both have very different styles of building. Oh we love to build! Carters favorite thing to build is windmills! They like to build cars and trucks with their legos. They will play for hours. My son loves to build cars and planes. My son likes to build tall things so he can knock them down with his action figures. My son love to build anything pertaining to science! He loves the little kits you can buy at Hobby Lobby where he can build a person, rocket, volcano and all those other neat things. I call him my little mini me because we both adore science lol! We like to build trains. My kids love building toys, especially Legos. They would love this! My daughter loves building different types of forts in the house. my kids LOVE to build! my husband is a mechanic so he brings home all sorts of stuff for them to tinker with! Putting up decorations in the garden is our favorite.